Voices of the past become muted over time. Such is the case with the telling of California's colonial history. We accentuate Spanish recollections that indelibly mark the contemporary landscape with Mission Revival buildings, reconstructed missions and presidios, place names, and even Taco Bell restaurants. But the full diversity and significance of the state's colonial past has been lost in the hustle and bustle of our twenty-first-century world. An eerie silence pervades the memories of thousands of native peoples and Russian colonists who, like the Spanish, participated in the creation of the California frontiers. We tend to forget that this state was forged at the crossroads of the world, for it was here that the extensive colonial domains of Imperial Spain and Tsarist Russia first touched on the Pacific coast. The roots of our modern ethnic diversity can be traced back to this colonial encounter among Indians, Spaniards, Mexicans, Russians, Native Alaskans, and many other peoples. As the site of one of the last major colonial expansions of the Spanish Crown in the late 1700s, California became the northernmost province of a vast empire that stretched across much of southern North America, Central America, and South America. By 1812, California was also the southernmost frontier of an extensive Russian mercantile enterprise centered in the North Pacific (see map 1). With the coming of the Russians, the fertile coastal shores of central California were transformed into the borderlands of two distinctive colonial domains. A chain of Franciscan missions and presidios, extending from San Diego to the greater San Francisco Bay, emerged as the cornerstone of the Spanish colonial enterprise in what became known as Alta California. But just beyond the northern reaches of the Presidio of San Francisco, Russian workers felled redwood to build the impressive palisade walls and stout log structures of Ross—the administrative center of the first mercantile colony in California. In transforming the region into a unique contact zone in North America, Spanish and Russian colonists populated the coastal landscape with their own distinctive adobe and Siberian-style wooden houses, churches, and forts and laid the foundations for two very different colonial programs. Caught within and between the Spanish and Russian colonies were thousands of native peoples residing in a plethora of small communities that dotted the coastal zone of southern and central California. As hunter-gatherer peoples, they made their living from both the sea and land by hunting marine mammals and terrestrial game, fishing for coastal and freshwater fishes, gathering edible plant foods, and collecting shellfish. These native communities varied greatly in language, tribal affiliation, population, and settlement pattern, yet they had much in common in their material cultures, broader world views (religious practices, dances, ceremonies), trade networks, and subsistence pursuits. Most coastal groups were organized into small polities, which have been traditionally defined by anthropologists as "tribelets," "village communities," or "tiny nations." Anthropologists have grouped those individual polities of which the members spoke similar languages into broader ethnolinguistic units. The Spanish and later the Mexican colonial system incorporated native peoples from eight major language groups of coastal California: Miwok, Ohlone (Costanoan), Esselen, Salinan, Chumash, Gabrielino, Luiseño, and Diegueño. The Russian managers of Colony Ross interacted primarily with native peoples who spoke Coast Miwok, Kashaya Pomo, and Southern Pomo languages. Spain relied on the Franciscan Order to manage the Indian population of its northernmost frontier, where the padres implemented a plan to transform the coastal hunter-gatherer peoples into a peasant class of neophyte Catholics. The Spanish, and later Mexican, colonial system consisted of twenty-one Franciscan missions, four military presidios, and three civilian pueblos along the coastal zone of southern and central California (map 2). The first mission and presidio were constructed in San Diego in 1769. The last Franciscan mission, San Francisco Solano, was erected in Sonoma in 1823, after an independent Mexico had assumed political control of Alta California. The Franciscan missions were designed from the outset to be the focal node of native and Hispanic interactions in colonial California. The missions typically housed two padres (the majority from Spain), a mission guard of six soldiers (most of whom were mestizos or mulattos of Spanish, African, and/or native ancestry from northern Mexico), and a thousand or more baptized Indians or neophytes recruited from nearby coastal villages and, in later years, from more distant communities in the interior (e.g., the Great Central Valley). Situated within or near the central mission quadrangle was the adobe church, convento or residence for the priests, dormitories and houses for neophytes, residential quarters for the mission soldiers, storerooms, work areas for the preparation and cooking of communal meals, and rooms for craft production. Developed as agricultural centers, the outlying mission lands incorporated hundreds of hectares of fields bursting with wheat, barley, and corn, as well as smaller walled gardens and orchards. Thousands of head of cattle and sheep, grazing on open livestock range, dotted the agrarian mission landscape. The first mercantile colony in California was founded by the Russian-American Company, a commercial monopoly representing Russia's interests in the lucrative North Pacific fur trade. In establishing the Ross settlement in 1812, on the rugged coastline 110 kilometers north of the Spanish Presidio of San Francisco, the Russians created the administrative and mercantile center of the Ross colonial district (or counter). This counter eventually included a port at Bodega Bay (Port Rumiantsev), three ranches or farms, and a hunting camp, or artel, on the Farallon Islands (map 2). Known collectively as Colony Ross, the district served as the California base for harvesting sea otter and fur seal pelts, for raising crops and livestock, and for producing manufactured goods—many of the latter of which were traded, both legally and illegally, to Franciscan missions in return for wheat and barley. The Russian-American Company assembled an international, multiethnic workforce for its California colony that included Russians, Creoles (persons of mixed Russian and native blood), and Native Alaskans. The company also recruited local Pomo and Miwok Indians as laborers. The majority of the pluralistic population resided at the Ross settlement, where the formidable redwood log stockade contained residences for the Russian managers and staff, a barracks for single men, an official quarters for visitors, kitchen facilities, administrative offices, and storehouses. Beyond the walls of the stockade ethnic neighborhoods were established where other workers resided, including lower-class Russian and Creole craftspersons and laborers, Native Alaskan sea-mammal hunters, and the Pomo and Miwok men and women who became part of the Ross community. The Franciscan missions and Colony Ross exemplify two ways that European colonial powers integrated local indigenous peoples into colonial infrastructures. At the vanguard of colonial expansion across the Americas, missions and fur trade outposts constituted the social settings where many North American Indians experienced their first sustained interactions with colonial agents. The arrival of missionaries and merchants in native territory often preceded, by many years, the waves of settlers that poured across much of North America in search of land to establish private homesteads, ranches, and farms. Because the settlement of California took place late in Spain's and Russia's colonial expansion in the Americas, both countries had many decades of experience in managing and overseeing native peoples in other regions, as well as in observing the colonial practices of other European nations. Significant theological differences permeated the policies and practices of the missionary orders.3 But, in stepping back from this evangelical diversity, we see that what differentiated the missionary settlements from other colonial institutions in North America was a focus on the two "c's"—conversion and civilization. Missionaries launched explicit enculturation programs designed to teach native peoples the Gospels, Christian worship, language skills, and the central importance of European and Euro-American world views, life ways, and economic practices. Most missionaries not only strove to make their colonies self-sufficient but also introduced European menus, dress, and crafts to indigenous populations. Mercantile outposts, such as Colony Ross, were typically founded by commercial companies that had in common an agenda of exploiting available resources (land, animal, mineral, and people) for great profits.4 The lucrative fur trade propelled many merchants to participate in the intensive harvesting of both terrestrial and marine mammals. Following the first European explorations of the Atlantic Coast and New Mexico in the late 1500s and early 1600s, the fur trade shifted to the tributaries of the Upper Missouri, the Rocky Mountains, and the Pacific Slope, as other areas became overhunted.5 By the late 1700s and early 1800s, the fur trade was dominated by British companies (Hudson's Bay Company, North West Company) and American enterprises (American Fur Company, Pacific Fur Company) in the United States and Canada, and by the Russian-American Company in the North Pacific. These companies hunted or trapped diverse land mammals for furs and skins, but the primary economic engine of the terrestrial fur trade was the beaver, the fur-wool of which was used in the manufacture of hats for European and American gentlemen, from the 1500s through the early 1800s. The maritime fur trade focused on the hunting of sea mammals, primarily sea otters and fur seals, along the Pacific coast from Alaska to Baja California. California’s earliest European colonists—Russian merchants and Spanish missionaries—depended heavily on Native Americans for labor to build and maintain their colonies, but they did so in very different ways. This richly detailed book brings together disparate skeins of the past—including little-known oral histories, native texts, ethnohistory, and archaeological excavations—to present a vivid new view of how native cultures fared under these two colonial systems. Kent Lightfoot’s innovative work, which incorporates the holistic methods of historical anthropology, explores the surprising ramifications of these long-ago encounters for the present-day political status of native people in California. Lightfoot weaves the results of his own significant archaeological research at Fort Ross, a major Russian mercantile colony, into a cross-cultural comparison, showing how these two colonial ventures—one primarily mercantile and one primarily religious—contributed to the development of new kinds of native identities, social forms, and tribal relationships. His lively account includes personal anecdotes from the field and a provocative discussion of the role played by early ethnographers, such as Alfred Kroeber, in influencing which tribes would eventually receive federal recognition. 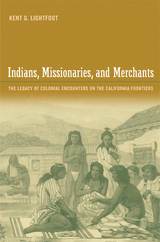 Indians, Missionaries, and Merchants takes a fascinating, yet troubling, look at California’s past and its role in shaping the state today. Kent G. Lightfoot is Professor of Anthropology at the University of California, Berkeley, and author of Prehistoric Political Dynamics: A Case Study from the American Southwest (1984), among other books.